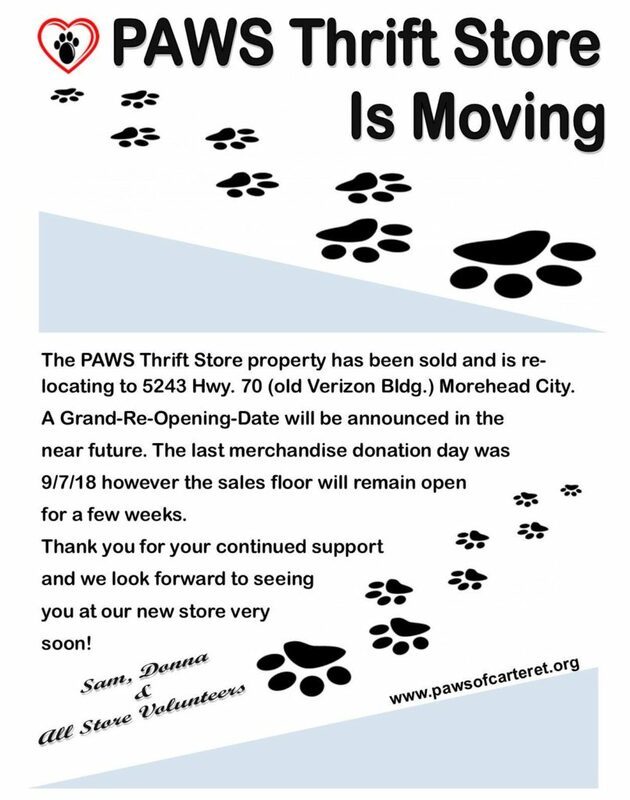 Paws of Carteret Pet Disaster Relief Supply Distribution Station will be open. Paws is receiving generous donations of pet food & supplies from all over NC and the US for residents in need. Donation truckloads & groups please contact us to verify you are sending supplies so we can arrange receiving. Thank you in advance for your compassion. The need is immediate and real in our area. One week ago yesterday we set up the pet-friendly portion of the hurricane shelter at the Newport Middle School. At the peak of the storm we had 141 animals and 400 + people. The shelter is still open. There are 46 pets still there. PAWS is still there (8 days and nights). We have sustained some serious damage in all of our properties. 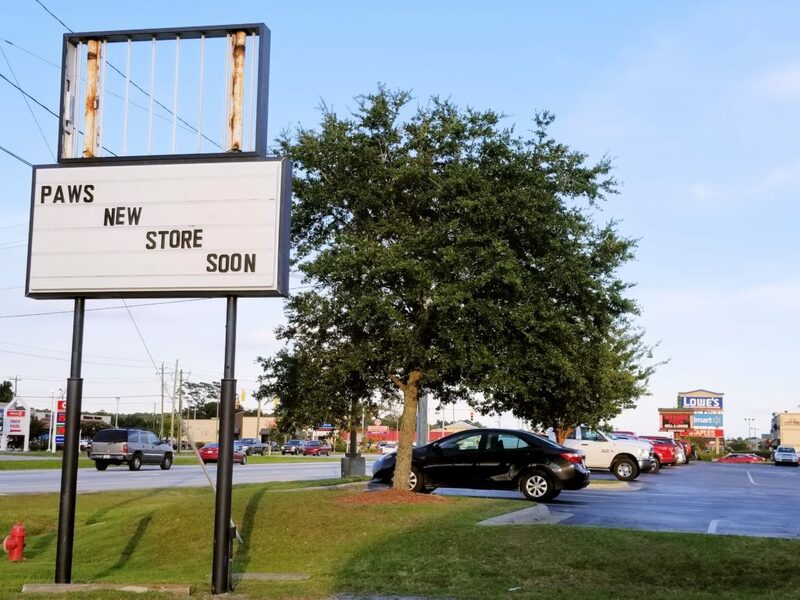 The old Thrift Store which we are responsible for until 10/31/18 remains closed. (such bad timing) The new Thrift Store flooded and must be professionally handled before we can even think about moving in. The New Building and the old building. The damages are too extensive to list here however I will be creating a comprehensive list. I began appointments today with water removal experts to explore our possibilities. I will have a second opinion tomorrow. I will contact our insurance company and see what our next step is. We are not covered at either store for wind damages. The old admin. building is currently not available to use. Staying inside almost requires a mask. I manage about thirty minutes at a time to try and do something or grab supplies for the hurricane shelter. The PAWS of Carteret Phase II Sally-port/Garage area has been cleaned up from the water and tomorrow, September 20 at 12pm we will open a Pet Supply Disaster Relief Station. The hours will be 12pm-4pm daily. Groups and private donations have started coming in and as the hurricane shelter is temporary and will close as soon as possible they asked us to stage the pet supplies at our location. This week my Granddaughter-in-law and her West Carteret High School Soccer team will be manning the station for us. If it turns out to be something that is needed to keep open for a while I’ll need a list of days that you can work (not you Cynthia!) or some new volunteers. By the way, on the bright side, tonight I had pc and internet and was able to open our email. We have received a $5,000 donation thanking us for all we are doing during the aftermath of hurricane Josephine. This is an amazing donation is almost the exact amount we raised and sent to hurricane Katrina victims along with a tractor trailer full of supplies! I have not seen any news reports or newspapers in this regard but it must be out there! I just thought you would like a bit of an update status. 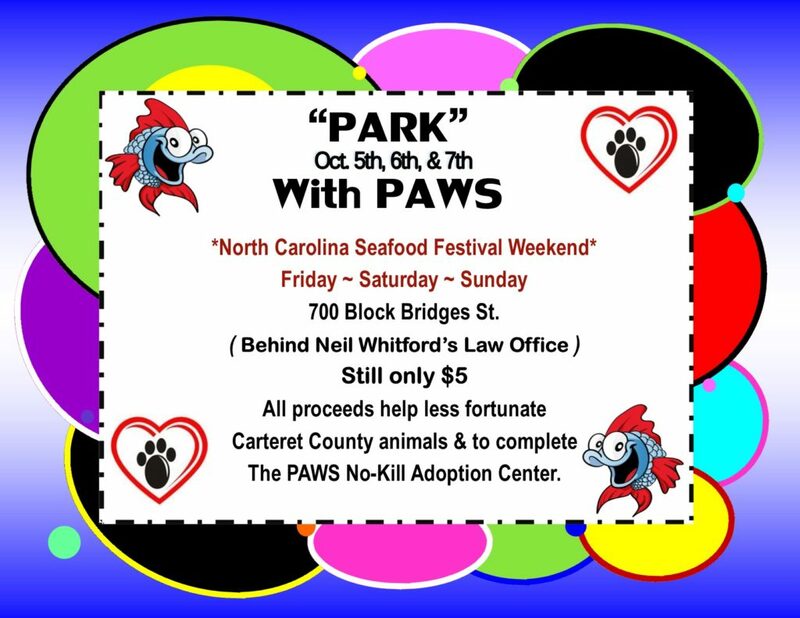 Description: PAWS Fundraising Event during the 2018 North Carolina Seafood Festival! Park With PAWS, still only $5 at our GREAT location!